“Therefore you have no excuse, O man, every one of you who judges. For in passing judgment on another you condemn yourself, because you, the judge, practice the very same things. We know that the judgment of God rightly falls on those who practice such things. Do you suppose, O man—you who judge those who practice such things and yet do them yourself—that you will escape the judgment of God? Or do you presume on the riches of his kindness and forbearance and patience, not knowing that God’s kindness is meant to lead you to repentance? But because of your hard and impenitent heart you are storing up wrath for yourself on the day of wrath when God’s righteous judgment will be revealed. “He will render to each one according to his works: to those who by patience in well-doing seek for glory and honor and immortality, he will give eternal life; but for those who are self-seeking and do not obey the truth, but obey unrighteousness, there will be wrath and fury. There will be tribulation and distress for every human being who does evil, the Jew first and also the Greek, but glory and honor and peace for everyone who does good, the Jew first and also the Greek. For God shows no partiality. So there we have it. How many of God’s attributes can we find in these passages? How wonderfully do they work together for the benefit of those who believe in an all merciful God? He is a God of judgment, He is God of wrath, but He is also a God of grace and mercy. Simply, we are all sinners and do not meet the standards of righteousness that God intends us to live our lives by. As a God of perfect judgment and as a God whose judgment is driven by His righteous standards, we are all condemned. But, through His mercy and grace, He has provided a way for our sins to be forgiven through our acceptance of Christ Jesus. To pay for our sin debt the very Son of God has been sacrificed. This undeserved mercy is through His magnanimous Grace. Wrap your head around that one for a moment. This abounding mercy comes at a very high price for God. This abounding mercy is coupled, however, with His sovereign grace and conforms to the standards of His righteous judgment. A substitute for our transgressions was needed and He provided it. A price has been paid. We all stand condemned yet He is a God of mercy. The price needed to be paid and God provided the payment. Thank you Lord that you are a God of mercy. This mercy is shown because He loves us and only asks that we accept His Son by faith. 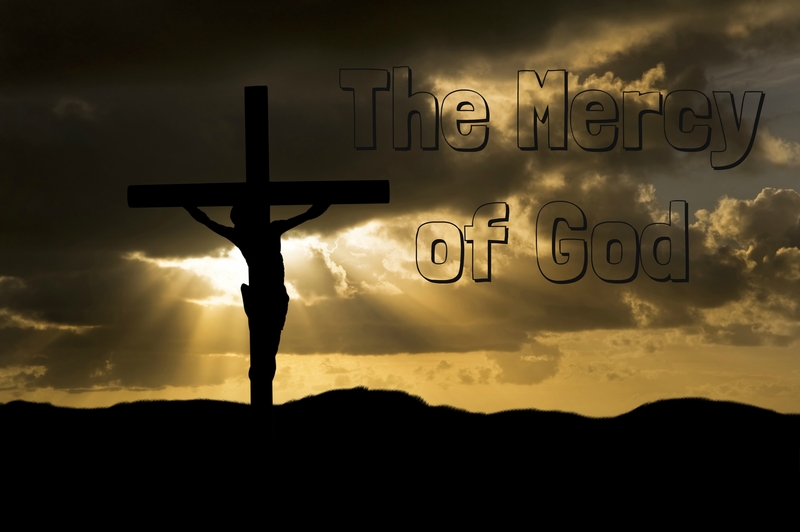 To accept His mercy is to accept His sacrifice and accept Jesus Christ as our Lord and Savior. He is a God of mercy, mercy to a fallen creation. God’s purpose in creation and redemption is to have a redeemed creation conformed to the image that man was created to be. That is the purpose of His mercy. Genesis tells us that man was created “in our image, after our likeness” therefore we were conformed to God’s image, the image of His Son, and filled with His Holy Spirit. That was the original plan of God. We were to conform to “their” image and walk in “their” ways. That was God’s intent until the fall after which we fell under His judgment and wrath. Thank you God that you are a God of mercy and grace! Our God of mercy calls to us in Micah 6:8 “He has showed you, O man, what is good. And what does the Lord require of you? To act justly, and to love mercy and to walk humbly with your God.” We are called to act justly as He does, to love mercy as He does, and to walk humbly before Him. These are the words to all of mankind. Mercy is offered to you and me alike. He has shown us what is good and answers what is required of us. Micah asks God in Micah 7:18, “Who is a God like you, who pardons sin and forgives the transgression of the remnant of his inheritance? You do not stay angry forever but delight to show mercy.” This merciful God has made provisions for us. ← The eyes of the LORD are in every place, Watching the evil and the good.